The walk today was slightly delayed by another locked hotel. I still can’t figure out how they get away with that. Aren’t there any fire codes? After heading back up two levels to the room to retrieve the keys, back down to unlock the door, then back up one level to leave the key where it would be found and finally back down and out again. All this is done with the daintiest of steps on the creaky wood floor so that I would not wake anyone else. Just another day in paradise. The whole walk today was on either dirt, rocky or cobblestone paths except for a very few small bits along back roads (and the stairway noted above). The brevity of walk meant that there were only three places to stop to eat so we had to eliminate one of the usual breakfasts or lunch. For those of you who have already done this walk, I bet you are surprised that the hill only gets mentioned in the third paragraph. Yes, there was a tough climb of about 250m over 2.5km but it wasn’t so bad. The morning was still chilly at the start and much of it was shaded. 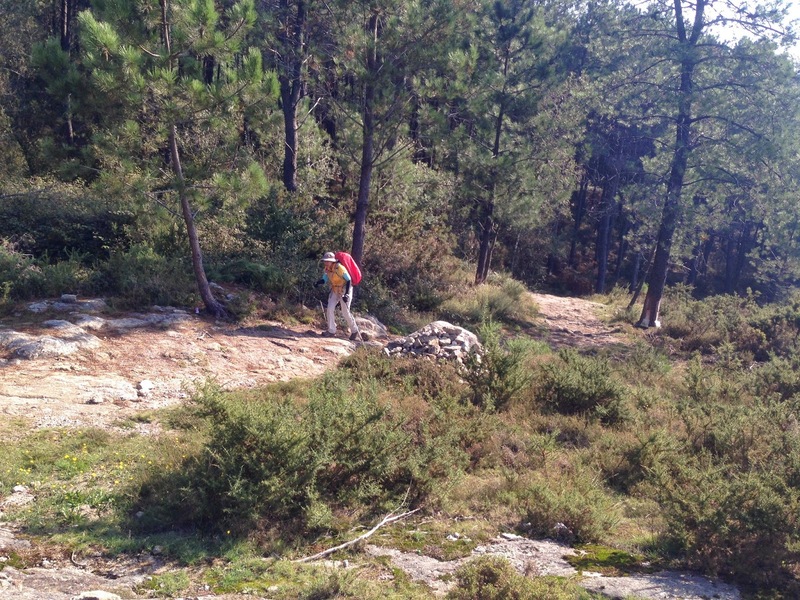 We got to do much of the scramble up the rocks with a vocal group of Portuguese mountain bikers. They were carrying their bikes most of the way which made me wonder “wouldn’t they be happier on an easier trail”? 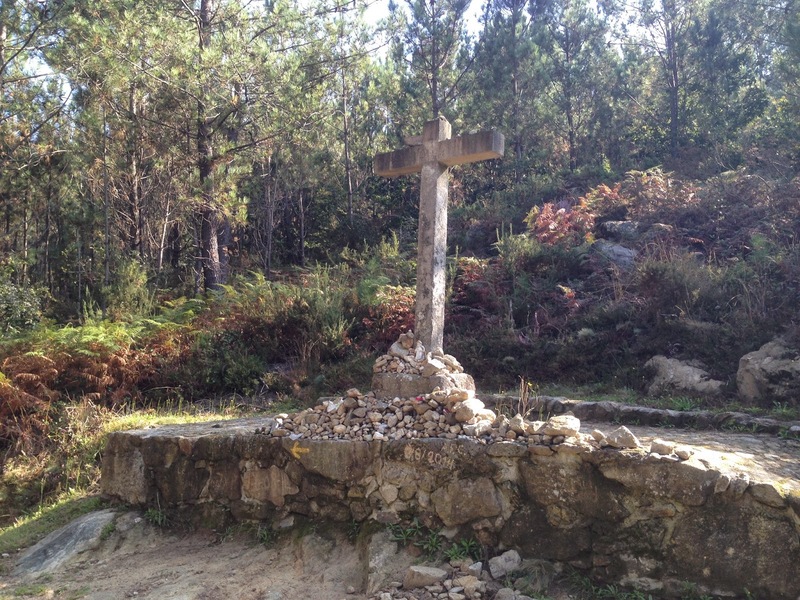 Two other points of the climb to mention where the Cruz do Mortos (a cross memorial to some of Napolean’s troops who were ambushed there). 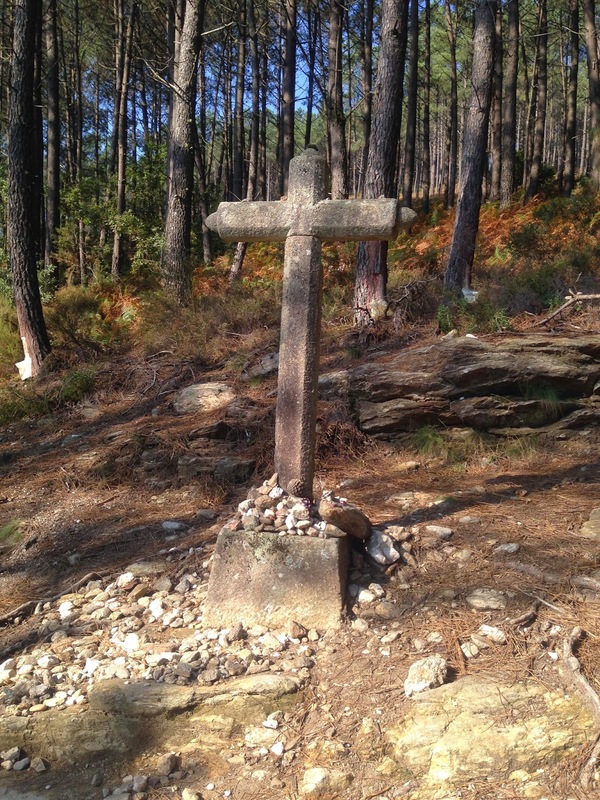 It’s not quite as moving to see as the Cruz de Ferro on the French Route, but it is historical. Another cross further along the trail should be considered nicer but not since sometime last month when an arse with a chisel decided to carve his initials (A.F.C) into the base. Prick. Also, just before the summit is the ranger’s station with a nice view of the valley to the south. Behind the station is a fantastic well with lovely, fresh cold water. Sort of. It seems to be collected in a large concrete tub and it fountains out of that. We tried it at the insistence of the bikers and it was very refreshing. As we left, we told some new arrivals about it and they went up to have some too. I saw one of three later, an American lady, who said that by the time she got there, the two other guys were dunking their arms in the tub and threatening to climb in. Yummy. We stopped for breakfast #1 in Arcozelo which was a little off trail and where dozens of pilgrims who sleep in longer likely passed us. We were the only pilgrims to stop there but there was one other patron – at 7:15am – and it looked like the large glass of wine in front of him was not his first of the day. Leaving that village, there is yet another medieval bridge that we crossed. I’m now beginning to wonder if building bridges in the 1200 – 1600’s was all they did or were they just really good at it. There are a lot of them around here. We arrived at the albergue if Rubiães right at noon which is a strange feeling. What do I do all afternoon? I could do what Inego did and just keep walking to Valença but I am not sure I could deal with seeing Melanie waving goodbye to me. We did the usual, i.e., register, shower, wash clothes and prepare the bed but it was still only a little after 1:00am. We ended up walking about 500m down the road in the sun to the nearest (only) restaurant. Can I add that mileage to my Caminho miles? We went to the same place for dinner so that makes two extra kilometers in total. The food was good but the two guys serving are pretty funny. We might not have found that out though if our Brazilian friend, Marcelo, had not walked in and sat with us. He had his backpack with him which worried us. It seems he had gotten into a disagreement with the woman running the albergue so he walked out. He came to the restaurant to ask if they knew where he could stay and they managed to fix up a private room for him for 15€. That’s not a bad deal. We had a good meal with the waiters constantly coming over to joke with Marcelo and then translate for us. One of the waiters is definitely more comedian than historian. He told us about a shortcut we could take at the beginning of the next day’s walk. He suggested, however, that we not do the shortcut or we would miss walking over the Roman bridge. He said it was about 1,000 years old. Well, unless Portugal hired some out of work Italian masons to build it, I bet the bridge is closer to 2,000 years old, when the Romans actually ruled this place. 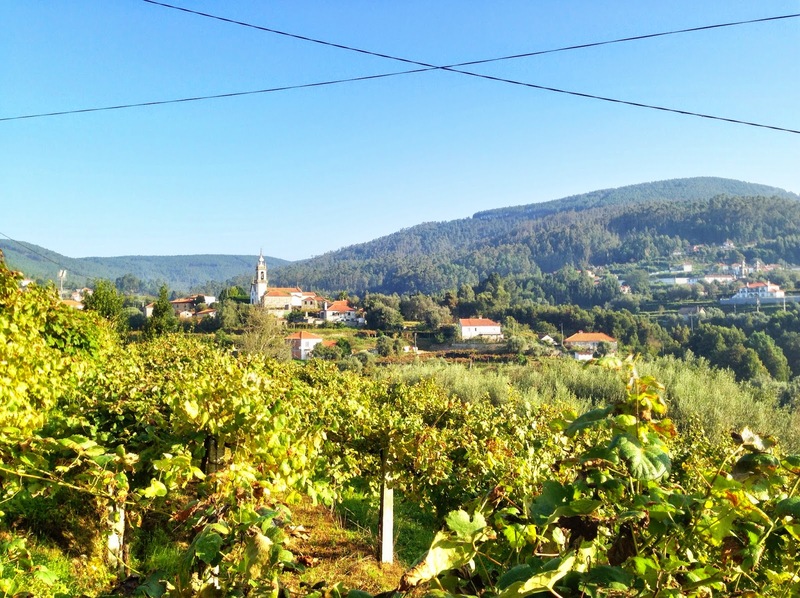 Note to those following us: there is a second albergue in Rubiães, only a hundred meters further down the hill from the old one. I don’t have any details of it though. The old one (old by comparison only as it is pretty new) is clean but all 36 beds are in one room. There is space to walk around every set of bunk beds but not much. It’s also a donativo albergue but the hospitalera suggests 5€ each. I gave her 20€ for the two of us and she still charged me one euro for using the washing machine. She’s not my friend anymore. I’m not helping her with the room sweeping. Actually, during breakfast #2 in Revolta at the Nunes place, there were dozens of pilgrims there and Marcia, the hostess, was the only person getting drinks or making sandwiches. The patience of some pilgrims was getting thin and many who had finished their meal just left their dishes on the table. Some brought them back to the counter which is customary in Portugal but even then, the counter was overflowing with dirty dishes. So what else could I do after being trained by my Mother, the Jesuits, Vincent at White Manta and Tony at Willing Hearts? I bussed all the dirty dishes and Marcia gave me my first “muito obrigado”. She even smiled. 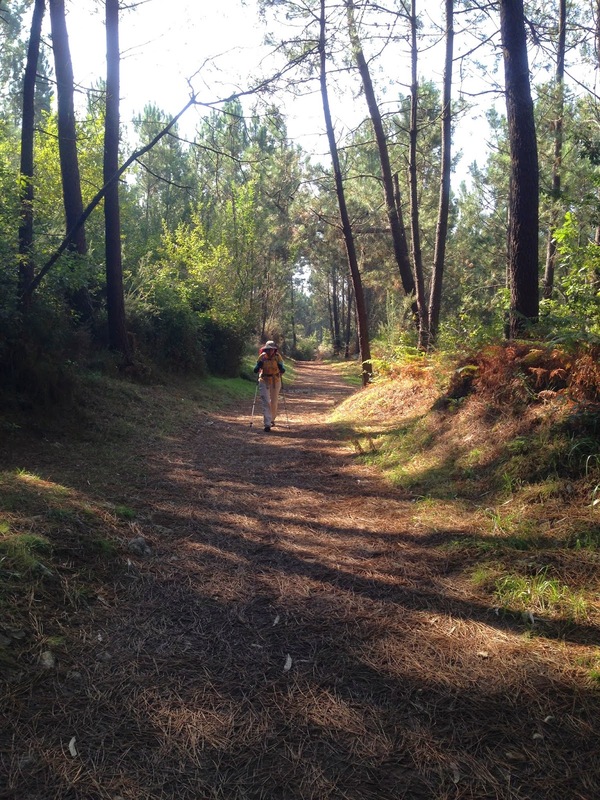 Thought for the day: I’m glad tomorrow is the last day walking in Portugal. It’s been fun but rougher than it should be. Without a doubt though, the toughest thing I have had to get used to is going into the right toilet. It’s hard for a poor reader like me to see the word “Homens” and remember that it isn’t “Womens” and walk past it to the next door. The screaming from surprised and frightened women is really getting to me.